The much awaited 30,000 mark was conquered by the S&P BSE SENSEX on Apr. 26, 2017 where the index level closed at 30,133.35, while the total return index level closed at 42,503.33. It took 557 trading sessions to go from the 29,000 level to cross the 30,000 level. The S&P BSE SENSEX was launched on Jan. 2, 1986; it is now over 30 years old. It comprises 30 stocks that represent the broader Indian equity marketplace. The base year of the S&P BSE SENSEX is 1979, with a base value of 100 index points. Source: S&P Dow Jones Indices LLC. Data from Jan. 2, 1986, to Apr. 26, 2017. Chart is provided for illustrative purposes. Past performance is no guarantee of future results. Exhibit 1 depicts the price returns of the S&P BSE SENSEX from its launch date. The total returns version of the index is available from August 1996.
Notable events during the 30-year journey of S&P BSE SENSEX include the following. S&P BSE SENSEX first passed 1,000 on July 25, 1990. S&P BSE SENSEX took 1,692 trading days to double the index value on Aug. 21, 1990. On April 28, 1992, the S&P BSE SENSEX dropped by 12.77%, its worst single day fall. A major revamp of the S&P BSE SENSEX happened on Aug. 19, 1996, when 15 companies were replaced. The first ETF linked to the S&P BSE SENSEX was launched on Sept. 1, 2003. On May 18, 2009, the S&P BSE SENSEX gained 17.3%, the best single day gain. S&P BSE SENSEX crossed 30,000 during intraday on March 4, 2015; however it closed below the 30,000 level. S&P BSE SENSEX closed above 30,000 for the first time on Apr. 26, 2017. Source: S&P Dow Jones Indices LLC. Data from April 3, 1979, to April 26, 2017. Table is provided for illustrative purposes. Past performance is no guarantee of future results. Exhibit 2 shows the details of when the S&P BSE SENSEX crossed various 1,000-point levels. 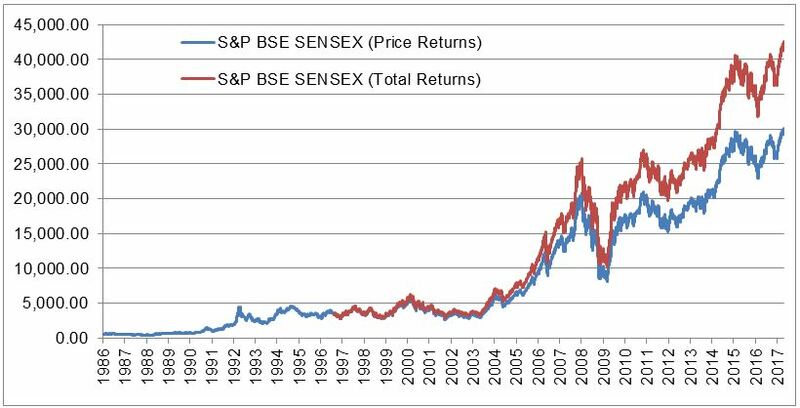 Over decades, the S&P BSE SENSEX is seen as an indicator of the economic growth of the Indian economy and is tracked to see how the Indian equity markets are performing. More than 30 years after its launch, the S&P BSE SENSEX closed above the 30,000 level on April 26, 2017.